I remember a spring afternoon in a microbiology class in college. We all set out to make sauerkraut to observe the work of the lactic acid-producing bacteria, Lactobacilli. We meticulously shredded the cabbage with overly dull knives. We carefully measured the salt and mixed it with the cabbage and watched as the cabbage seeped liquid. We dumped the juicy mixture into sterilized jars – and waited. I do not remember how long we waited, but when the time had come, our professor encouraged us to try our lacto-fermented cabbage – our sauerkraut. I don’t think anyone in the room was brave enough that day and I must admit, it didn’t look particularly pleasing nor did it smell like a tempting dish to sink our forks into. Lacto-fermented (or “cultured”) food was prized by the Romans for its medicinal properties and is a mainstay in the diets of many cultures around the world, the most well known foods being sauerkraut, kimchi in Korea and pickled vegetables eaten by the Japanese at almost every meal. Lactic acid is a natural preservative. The lactic acid-producing bacteria, Lactobacilli, convert sugars and starches into lactic acid. These beneficial bacteria are present on the surface of all living things and especially like to congregate on the leaves and roots of low-lying plants. The alchemic changes that take place within the fermentation process were drawn on for centuries to provide preservation to foods that would otherwise rot without proper storage. Lacto-fermentation has many advantages that go beyond its preservation powers. Preserving foods using these naturally occurring bacteria is a simple way to retain the food’s nutritional benefits as well as increase fibre and digestion-enhancing enzymes, similar to the health benefits of sprouted bread. Increasing lactobacilli in the digestive system helps the digestive tract maintain a healthy balance of flora, yet we tend to eat very little food high in these natural bacteria, other than yoghurt. These powerful organisms also produce antibiotic and anti-carcinogenic substances. Lactic acid breaks down proteins aiding in the absorption of iron. It also activates pancreatic secretions, which is beneficial to diabetics. Certain lacto-fermented foods, like sauerkraut, contain large quantities of choline, lowering blood pressure, regulating the passage of nutrients in the blood and aiding in the metabolism of fats. By choosing organic, you are not only supporting organic agriculture and the farmers who choose to farm this way, but also rewarding your body. Organic vegetables and fruits are free from synthetic chemicals and contain more lactic acid bacteria. The vegetables should be finely shredded, chopped or sliced to expose as much surface area as possible, which accelerates the fermentation process. Mix in the salt. Because lactobacilli are a salt tolerant organism, the amount of salt you use will depend on your taste and the desired outcome. More salt will preserve the vegetables longer by pulling more water from the vegetable and hardening the pectin, leaving the final product crunchier. Less salt will quicken the fermentation process; however, it is worth noting that lower salted solutions may result in surface moulds. You will have to experiment to obtain your favourite recipe but remember that it is easier to add salt than take it away. That being said, a common ratio to start with is two to three tablespoons of salt to five pounds of vegetables (that’s around 1 metric tablespoon* per kilo). The role of salt is to inhibit the growth of putrefying bacteria until enough lactic acid is produced to preserve the vegetables for many months. 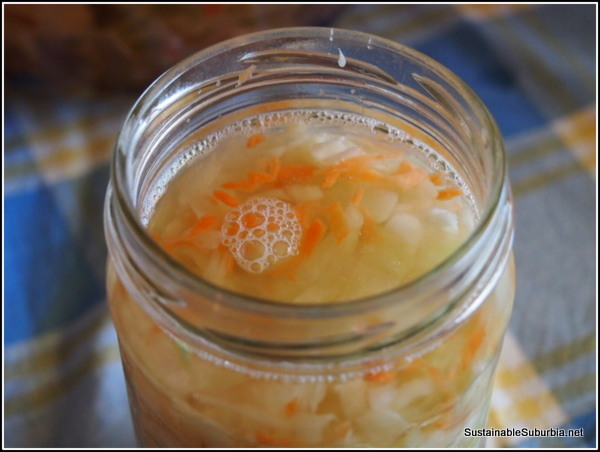 Because the amount of lactobacilli on vegetables can vary, it is recommended that a small amount of homemade whey be added to each jar as it supplies lactobacilli and acts as an inoculant. Whey can be omitted in vegetable recipes, but it is deemed necessary when using fruits. Tamp the vegetables down with the salt to begin the release of juices. You will need to tamp them down very firmly, until the juices raise to about a centimetre above the vegetables. 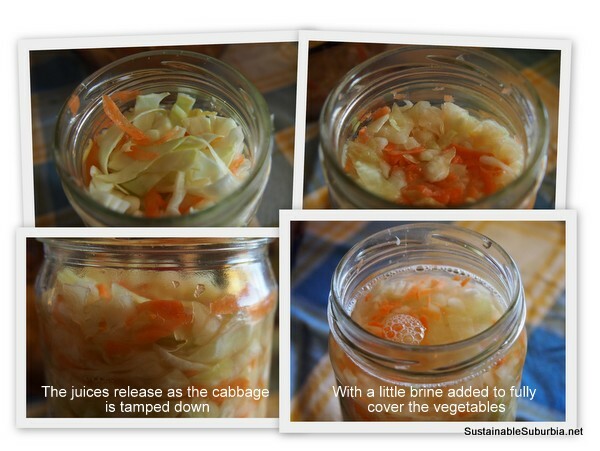 Depending on the vegetables you can also squeeze them with your hands (cabbage works well this way). This could take around ten minutes of solid squeezing. If you are unable to squeeze enough liquid out of the vegetables, add a small amount of a mild brine (with around 1 tsp salt per cup of filtered water), to the level of about one centimetre (or 1/2 inch) above the vegetables. If you choose to use a wide-mouth glass jar, leave about one inch of space between the vegetables and their liquid and the top of the jar, ensuring the liquid covers the vegetables. During the process of fermentation, the vegetables will expand. Lightly screw on the lid during the initial fermentation so that any build-up of carbon dioxide can release. Alternatively, you can use the “open crock” method. Crock pots with ceramic interiors can make great fermentation vessels. Tamp the vegetables and juice into the vessel and cover the vegetables and liquid with a heavy plate that sits just inside the pot and weight it down with a heavy object (a jug of water works well). Drape the pot with a tea towel to keep flies away. I have also read that you can use a double bag filled with water to cover the surface but I am not sure about the possibility of plastic leaching into the food. You’ll have to make your own decision regarding this or experiment and come up with a creative way to cover the mixture. The idea is to keep the mixture from having contact with oxygen. If the mixture comes into contact with oxygen, white mould is likely to develop on the surface. The mould is common and should be scraped off and discarded. There are crocks that are designed specifically to form a seal while allowing gas to escape; however, these can be difficult to source and rather expensive, but may take some of the laborious work out of the process. The vegetables should be kept at room temperature and out of the sun for between four and seven days. You can also culture your vegetables at lower temperatures for weeks or even months. Taste your vegetables every few days after initial fermentation to become familiar with how the flavours develop. Store the jar in the refrigerator when the mixture develops to your liking. Inevitably, some batches will go bad. The repulsive smell and possible slimy nature of the vegetables will let you know right away. Today, my taste buds have become a little more refined than the days of those first college “experiments”, but I have never returned to the art of lacto-fermentation. I have a great vegan Reuben recipe that calls for sauerkraut but I buy it from the grocery store. However, given the health benefits and the overall ease of preparation, I just may give sauerkraut another go. *Editor’s note: A metric tablespoon is 20ml, which is equal to four (metric) teaspoons, but in US measurements, it’s only three US teaspoons (just under 15ml), and in UK imperial it’s also 3 teaspoons, but the teaspoons are bigger, so a UK tbsp is just over 17ml. Confused yet? This was a really helpful post! I just made lacto-fermented salsa this weekend, but totally did not understand the science behind it. Thank you for explaining. Glad it was helpful Jenny!